Early in her career as an educator, Marimo Berk was asked to lead a special education class. She had no formal training and no experience working with children with disabilities. In that moment, Marimo recognized two things: the shared joy that results from helping marginalized children reach their potential and the urgent need to improve the status quo for kids with special needs. We must realize these challenges do not prevent people from contributing to our world. 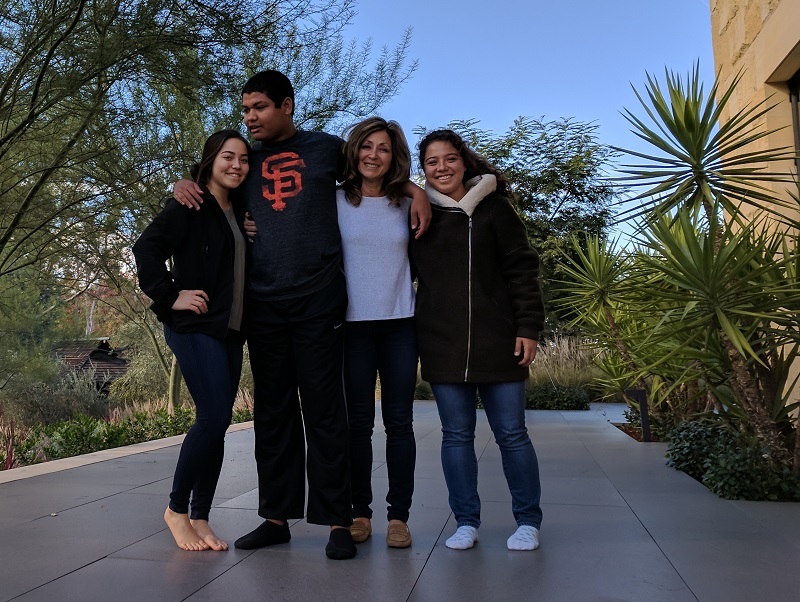 When Marimo’s son, Derek, was diagnosed with autism at 17 months old, her advocacy quickly grew to action. And so they did. The Creekside School began with two students at Marimo’s home and has grown to an enrollment of 10 in multiple classrooms. The school’s curriculum caters to each student's unique set of interests, strengths, and needs and includes community outings, volunteer work, life skills development, music, art, and even animal-assisted therapy – “that really brings a smile to their faces,” Marimo notes. UNICEF USA Northwest Regional Board Chair Marimo Berk with her son, Derek, and nieces, Makena and Mikelle Foster. Inspired by the growth and success of the Creekside School, Marimo sought to make a difference for even more children. As the daughter of a UNICEF beneficiary – Marimo’s mother received support from UNICEF while growing up in Japan following World War II – UNICEF was top of mind. “My mom would always save whatever money she had left at the end of the month and have me write the check to send off to UNICEF,” she recalls. Marimo joined UNICEF USA’s Northwest Regional Board in 2014, and the impact of her partnership cannot be overstated. Through the Derek A.T. Drummond Fund at UNICEF USA, established in honor of her son, Marimo funded a child protection program in Montenegro that helped to reshape communities’ perception and treatment of children with disabilities. Also in Montenegro, Marimo supported a partnership with Special Olympics promoting equal opportunity in access to playgrounds and sports. Her gift toward UNICEF’s Accessible Books program leveraged technology to ensure that all children, regardless of physical, developmental, or learning limitations, are able to study along with their classmates. Marimo also helped deliver urgent relief to children affected by conflict and natural disasters. Malnourished children in Botswana received life-saving treatment. Syrian refugees gained access to education, offering a brighter future. Her trust in UNICEF is further exemplified by her generous unrestricted gifts, which allow UNICEF to respond wherever the need is greatest. On a field visit to Za’atari refugee camp in Jordan, Marimo Berk plays with three young boys at a UNICEF-supported Child-Friendly Space. 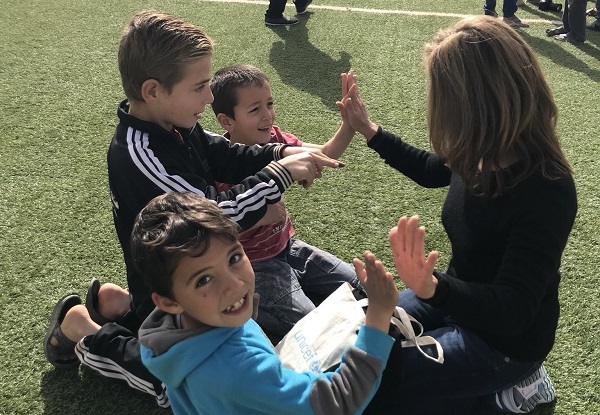 A visit to the Za’atari refugee camp in Jordan served to remind Marimo of the resiliency of children – and of the difference that UNICEF is making. There, she observed malnutrition-screening, immunization campaigns, and Child-Friendly Spaces where kids could seek counseling, education, or simply a safe place to play. I just loved these kids - the hope and eagerness in their eyes will stay with me and inspire me always. She also witnessed progress in the opportunities offered to children with disabilities in the camp – and the need to do more. Learn more about UNICEF’s work for children with disabilities. Photo at top: UNICEF USA Northwest Regional Board Chair Marimo Berk assisted students in the Za’atari refugee camp in Jordan with an art project.